Today, we poured our first set of clonedel pieces for the upcoming set of Reprap Prusa 3D printers that we’re going to make at Ace Monster Toys. 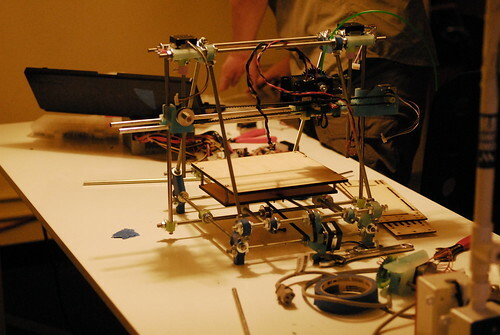 “Clonedel” is what people have been calling the Reprap printers where the pieces normally made from printed plastic are made from molds, instead. The printing of these parts on another printer, such as the makerbots we have at AMT, takes about 14 hours. Pouring them takes about 10 minutes plus pulling them from the molds and letting them cure. You can see some of the first set pf poured parts below. 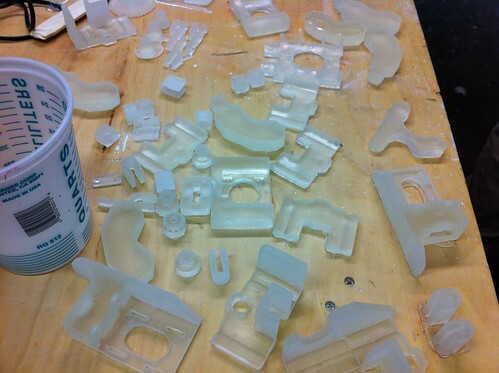 As it turns out, the molds had a few flaws in places, being either too rough or having some air bubbles, so we weren’t able to pour all the parts with the level of detail that we really want or without damage. We’re going to clean up some of the pieces and I’m going to print a few more on the makerbot in order to make a new mold for those pieces. Almost all of the larger pieces are fine and they take the longest to print so this is still an overall positive. The end result is a 3D printer that is much smaller and simpler than the makerbots we’ve been using in the space. 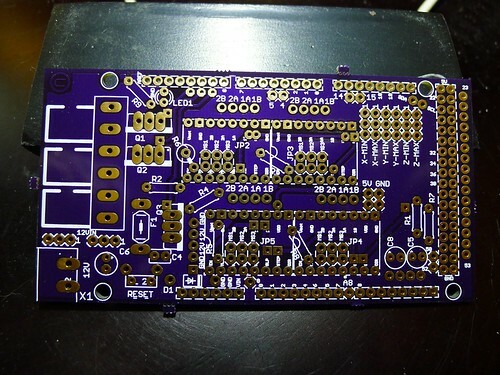 I’ve also had RAMPS boards made to act as the electronic brains for these in a fetching purple. I and others will be soldering components to these sometime in the next couple of weeks. The end result of all of this is that we hope to go from having two makerbots in Ace Monster Toys and a couple more in the homes of members to, eventually, a dozen or more of these either in the space or in member homes. We’ve also just ordered our 80 watt laser (with a four foot by three foot or more work area) from China for the space. This will give us the ability to laser cut acrylic and plywood sheets, opening up a whole range of work possibilities.